Ross Pearson, the lightweight winner of The Ultimate Fighter 9, joined us here at MMAFighting.com Thursday afternoon to discuss his upcoming fight against Dennis Siver at UFC Fight Night 21 on March 31 in Charlotte, N.C.
Below is the transcript of Pearson’s responses to our readers’ questions. 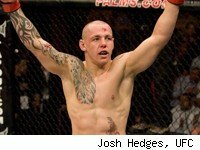 Ross Pearson Live Chat originally appeared on MMA Fighting on Thu, 11 Mar 2010 12:00:00 EST . Please see our terms for use of feeds. Urijah Faber Finally Gets His Day, but Is It Too Late? “Strikeforce: Miami” live and official weigh-in results from Sunrise, Fla.